While I wish there was a magic formula for closely reading and comprehending text, there isn't. 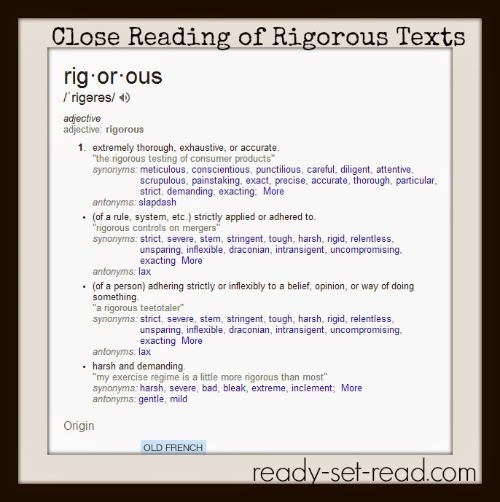 I don't claim to be an expert on close reading, but lately I've been reading a lot of great books and blog posts with strategies for close reading. 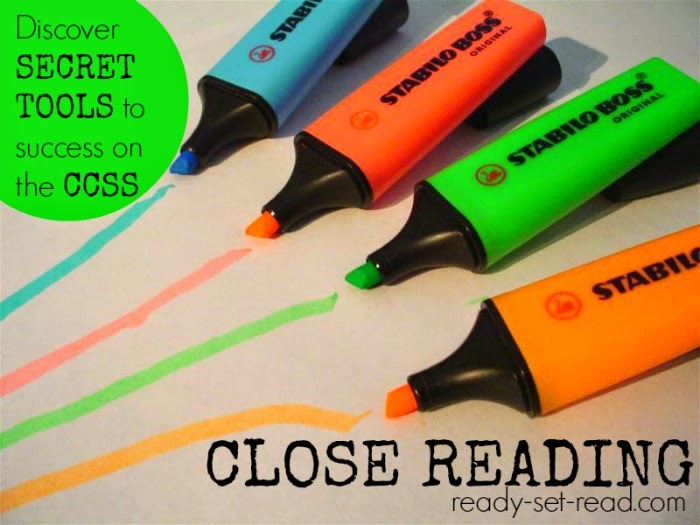 Today I'm sharing some of what I've learned about close reading. I'm also giving you a peek into my professional library. I've even found some resources you can use in your classrooms right now. Did your teachers have the poster with Garfield "learning by osmosis" back in the 80s? (I really want to share it, but I'm afraid I'd be breaking copyright, so just google it). No matter how hard Garfield tried to convince us this was a possibility, I don't think there is any merit in reading in close proximity to text, so lets move on to the real stuff today. While packing too many kids into a small classroom doesn't correlate to higher reading scores, there is a benefit to reading in close proximity to an adult. "Children are made readers on the laps of their parents." Emilie Buchwald. In fact, I wonder if many reading problems could be avoided if all children were given an opportunity to hear thousands of bedtime stories? 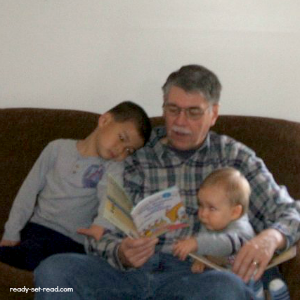 My Dad reading to my nephew and baby Logan. I'd recommend the book, "Reading Magic" to those parents of young children who want to prepare their children for close reading. 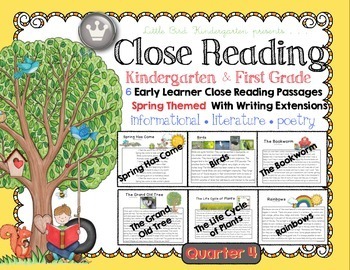 While the book isn't specifically about "close reading" it will help you enrich read aloud time. Mem Fox says in her book, "Reading Magic"
Many early grades teachers are already mimicking this lap reading experience in the classroom through shared readings and interactive read alouds. While shared reading looks different than the close reading of upper grades, you are laying the foundations of literacy. One of my favorite resources for helping young children become literate is Fountas and Pinnell's "Literacy Beginnings". Here's a taste from a chapter on "Using Interactive Read-Alouds to support Emergent Readers". "Many children who enter prekindergarten have been read bedtime stories for two years or more; others have heard many "lap stories", beginning from the point they could look at a book and listen to even part of a story. Others have had less experience in hearing written language read aloud. Luckily, with a rich prekindergarten program, you can help those children 'catch up' on their reading! If the activity is engaging and fun, they learn very quickly. In this chapter we explore the important role of conversations with children in connection with reading aloud to them." 3. Highlighters and sticky notes. "Funny, but highlighters and small groups do work, nice post." This text provides lessons for teaching "signposts" or teaching students to notice features in text that would help a student read closely and better comprehend the text. Notice and Note provides explicit lesson plans that help students know exactly what to do when they notice a text feature and how to ask themselves questions to extend the learning. Here are the authors thoughts on responding to texts. They go on to give examples of signpost bookmarks and reading logs, sticky notes, allowing students to write in the actual book, or using an ereader to highlight text. I found a few free printables on teachers pay teachers that can be used for these signpost lesssons you are using them. Plus there are awesome logs and bookmarks as well as sample anchor charts in the text itself. Isn't that cool? No longer are we limited to a board of sticky notes responses at the end of a lesson. Now my classroom can connect with your classroom. I think learning can increase exponentially in this way. I have heard a lot of talk about rigor lately. It is encroaching on close reading's spot on pinterest boards and blogs. I'll be the first to admit, I've had a flawed view of rigor. I've mistaken rigor for "hard". If kids can read "hard" books, they will be competent readers. The book "Notice and Note" helped me to reshape my ideas about rigorous text. "Rigor is not an attribute of a text but rather a characteristic of our behavior with the text." I'm beginning to learn that rigor isn't the text itself, it's the level of engagement with the text. This idea is further supported by Lucy Calkins, in "Pathways to the Common Core, Accelerating Achievement"
Pathways to the Common Core has been my favorite book for breaking down the language of the CCSS and giving me a fuller understanding of the verbage and the application of the standards to classroom teaching. 5. Reread, reread, reread, reread. It turns out rereading is a hallmark of close reading. To me, this quote means that the point of the lesson is not to reread. The point of the lesson is for readers to begin to notice features in text and analyze them closely. 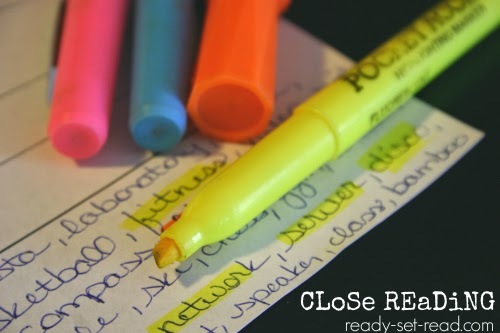 If we walk out of the classroom door at the end of the day and simply check off that we read the text three times, highlighted texts, and taken notes, we have not read closely. I love this video of close interactive reading of Bats at the Ballgame from +Jennifer Jones. The students are engaged with the text and the talk is authentic. The notion of interrupting the reading every 1.5 seconds to ask questions is clearly not a best practice for helping students comprehend text. However, the common core state standards seems to call for a sharp increase in literal comprehension of text. As I mentioned, I've been reading "Pathways to the Common Core: Accelerating Achievement." The authors Calkins, Ehrenworth, and Lehman point out a shift in teaching reading. For many years, our instructional focus was to help students make connections to the text. In Pathways to the Common Core, the authors highlight that the common core state standards ask students read within the four corners of the text. That is, students need to refer explicitly to text, refer to details and examples in the text, and by fifth grade they need to be able to quote directly from the text. It's easy to jump to the conclusion that asking long strings of text dependent questions will help students read within the four corners of the text. However, Beers and Probst suggest that text dependent questions don't seem authentic to learners. Teachers simply ask questions that they already know the answer to, students answer the questions by refering to the text... not very engaging... not very rigorous. 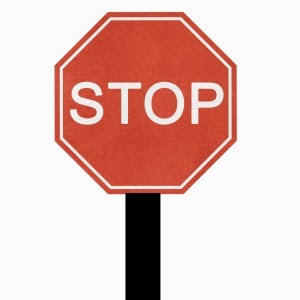 They suggest we should, instead, teach the students to notice signposts in text and teach students how to ask ONE question about each signpost. The full lessons are in their book and are awesome! I've also found a resource for helping students to take ownership of this process of citing text based evidence. +Jennifer Jones has a text based evidence graph to help students use TBE and evaluate their usage. 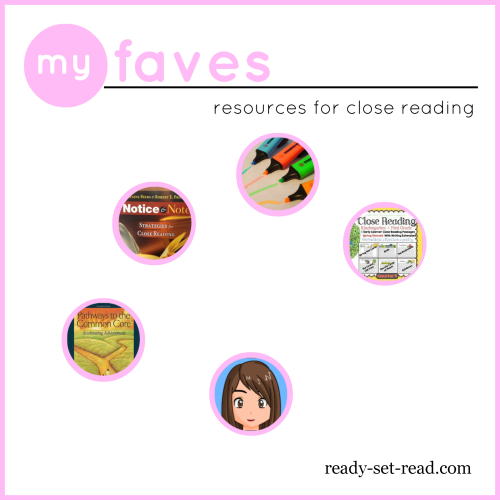 Read her blog post that explains why she created this resource. Jennifer Jones' insight into the readers of the 21st century is awesome! It makes me rethink everything about teaching. If you stuck with me to the end of this lengthy post, pat yourself on the back and give yourself a gold star. I love being able to reflect and share what I've been learning through studying professional texts. I also love to engage in conversation with other educators about literacy related questions. I started a G+ community for that very purpose. I'd love if you'd hop over to Reading with Children and share your faves for teaching students to read closely.